Governor Andrew M. Cuomo today announced the grand opening of the del Lago Resort & Casino in the Town of Tyre, Seneca County. The resort is a $440 million private investment featuring a 94,000 square-foot gaming floor, a 2,400-seat performance space, and multiple dining and retail options. Built on 85 acres of undeveloped land, the project generated more than one million construction hours and created 1,500 permanent jobs in the region. “The opening of del Lago means new jobs, increased economic activity and one more step forward in our efforts to strengthen and transform the Finger Lakes region,” Governor Cuomo said. “For decades, New Yorkers looked beyond our borders to spend their entertainment dollars, but with this resort destination casino, we will attract New Yorkers and visitors alike to explore all this region has to offer." Governor Cuomo’s Upstate New York Gaming and Economic Development Act of 2013 mandated that all state revenue from del Lago be returned to localities. 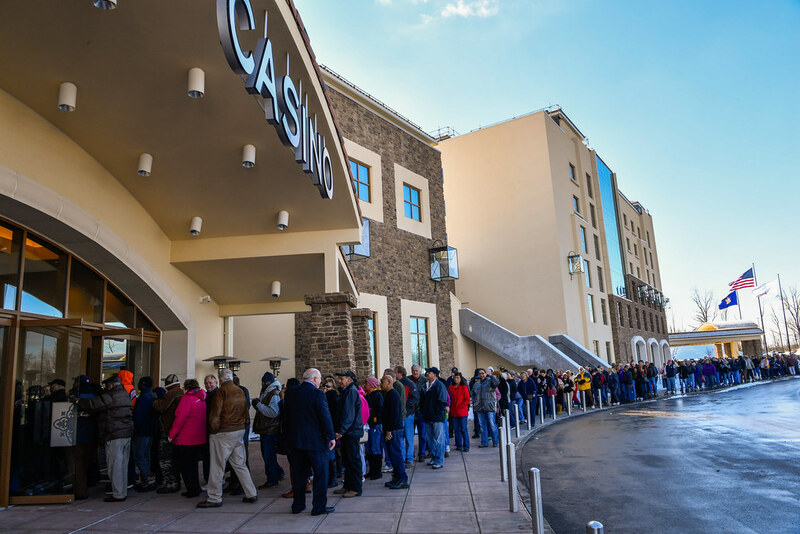 Ten percent of the state’s tax revenue from the casino is split between the Town of Tyre and Seneca County for hosting the facility, and Broome, Chemung, Tompkins, Schuyler and Wayne counties share another 10 percent. The remaining 80 percent of revenue is distributed statewide to support public education and provide tax relief to New Yorkers. Del Lago Resort & Casino is a partnership between Rochester-based Wilmorite Inc., and Peninsula Pacific. Peninsula Pacific comprises of the former leadership team from Peninsula Gaming, which has a combined 50 years in developing and managing regional casinos in five states. JNB Gaming will manage the casino. JNB and its principals are widely recognized throughout the country as premier casino developers and operators. “For decades, New Yorkers looked beyond our borders to spend their entertainment dollars, but with this resort destination casino, we will attract New Yorkers and visitors alike to explore all this region has to offer." In addition to creating 1,800 jobs during construction, del Lago has created 1,500 permanent jobs with the casino opening and will create another 200-300 when the hotel and spa open this summer. Del Lago Resort & Casino will also be a boon to local wineries, breweries, restaurants, hotels, stores, tourism destinations and other businesses. In addition, local governments — Town of Tyre, school district, Seneca County and other neighboring counties in the gaming region established by the state — will see a significant, positive, direct impact from del Lago Resort & Casino through their share of the casino’s gaming tax payments to the state. life and wish del Lago's staff and patrons great success." Based on del Lago’s estimates, the resort and casino is projected to bring in 3.2 million visitors per year. In total, the four commercial casinos – del Lago, Tioga Downs, Montreign and Rivers -- when fully operational will generate $325 million in gaming taxes, of which $65 million will be directed to localities and $260 million will support public education. Portico by Fabio Viviani: Celebrity chef and “fan favorite” on Bravo’s hit reality series “Top Chef,” Fabio brings a sophisticated take on Old World Italian-inspired foods and handmade pastas, as well as seafood, steaks and chops grilled over hardwood. Del Lago Resort & Casino is located 1133 State Route 414, Waterloo NY, 13165, just off Exit 41 on the New York State Thruway. Del Lago Resort & Casino is a $440 million casino, 205-room hotel and spa in Waterloo, New York. The mission behind del Lago Resort & Casino has been to act as a gateway to the Finger Lakes region, leveraging the natural beauty and unique offerings while enhancing tourism. Savor NY — MacKenzie-Childs at del Lago is a unique retail outlet where local vendors bring the Finger Lakes region directly to del Lago patrons with MacKenzie-Childs and Jay Strongwater products and a wide variety of local fruits, cheeses, baked goods, wines and beers, and other area specialties. Del Lago Resort & Casino also features 2,000 slot machines and 89 gaming tables, including 12 poker tables; Portico by Fabio Viviani, a restaurant with a sophisticated take on Old World Italian-inspired foods and spirits; The Vine, a 2,400-person entertainment center, bar and restaurant; Farmers Market Buffet, featuring locally sourced comfort foods; Centrifico, a bar/lounge area in the center of the gaming floor; The Sociale Café & Bar, serving “gastro spa” cuisine and beverages; and a 4,200-square-foot food court. The hotel, spa, banquet facility and The Sociale Café & Bar will open in summer 2017. For more information, visit delLagoResort.com. Today’s announcement complements “Finger Lakes Forward,” the region’s comprehensive blueprint to generate robust economic growth and community development. The State has already invested more than $3.4 billion in the region since 2012 to lay the groundwork for the plan – investing in key industries including photonics, agriculture and food production, and advanced manufacturing. Today, unemployment is down to the lowest levels since before the Great Recession; personal and corporate income taxes are down; and businesses are choosing places like Rochester, Batavia and Canandaigua as a destination to grow and invest in. Now, the region is accelerating Finger Lakes Forward with a $500 million State investment through the Upstate Revitalization Initiative, announced by Governor Cuomo in December 2015. The State’s $500 million investment will incentivize private business to invest well over $2.5 billion – and the region’s plan, as submitted, projects up to 8,200 new jobs. More information is available here.